Easter is just days away and recipes for lamb, tender asparagus, and, of course, eggs, have swamped my inbox. Consequently, I’ve had deviled eggs on the mind and couldn’t resist whipping up a batch this week. 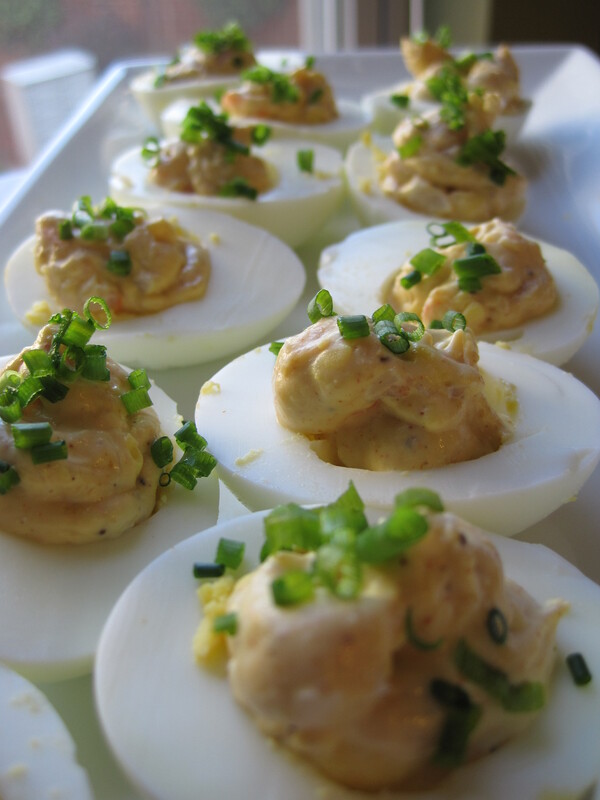 Normally reserved for picnic fare, I’ve noticed that deviled eggs have become a little more glamorous these days. It seems the traditional deviled egg made with mayonnaise and mustard and sprinkled with earthy paprika is somewhat passé. Nowadays, deviled eggs strut their stuff with ingredients such as smoked salmon and crab and toppings of caviar and salmon roe. And while I certainly appreciate the culinary advancement of the humble egg, I’m not sure I’m ready to abandon the original comfort food favorite. And this is why my recipe for deviled eggs sticks to the traditional recipe, but adds a little interest with diced shrimp and a little Old Bay seasoning. It’s the egg you remember, but with a twist that makes you know that they’ve advanced with the times. And perhaps most importanly, this recipe is the perfect use for those colored Easter eggs that will be littering your lawn on Sunday. That is, as long as the Easter bunny didn’t put them out the night before! Place eggs in a medium saucepan and cover with 1″ of cold water. Bring the water to a boil over medium-heat. When water is boiling, cover the pot with a lid and remove from the heat. Let the eggs sit, covered, for 15 minutes. Remove the eggs from the water and place in a bowl of ice water to cool. To easily peel the eggs, crack the eggs open by rolling them on a counter while pressing down slightly with the palm of your hand. The shell should break into tiny pieces making it easier to remove the shell without pulling off pieces of the cooked egg white. 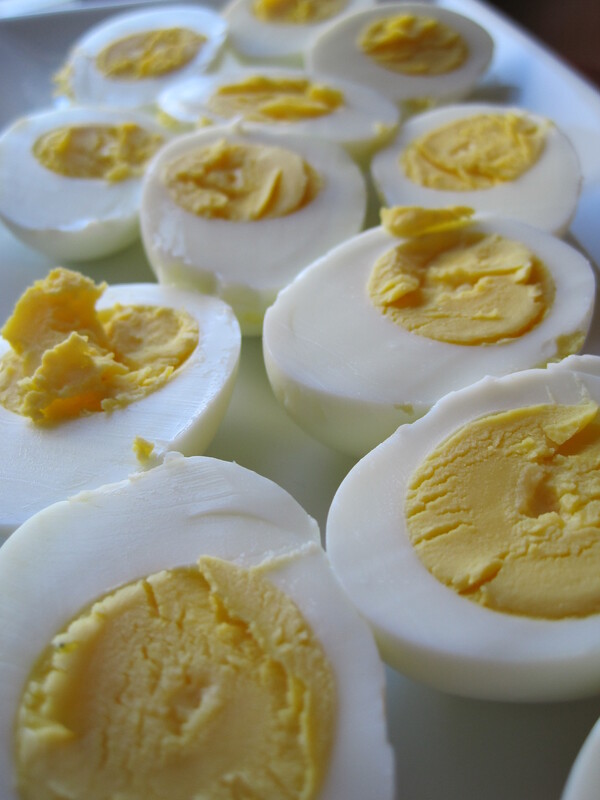 Slice each peeled egg in half and use a small spoon to carefully remove the cooked yolk and place it in a small bowl. Set the egg whites aside until ready to use. 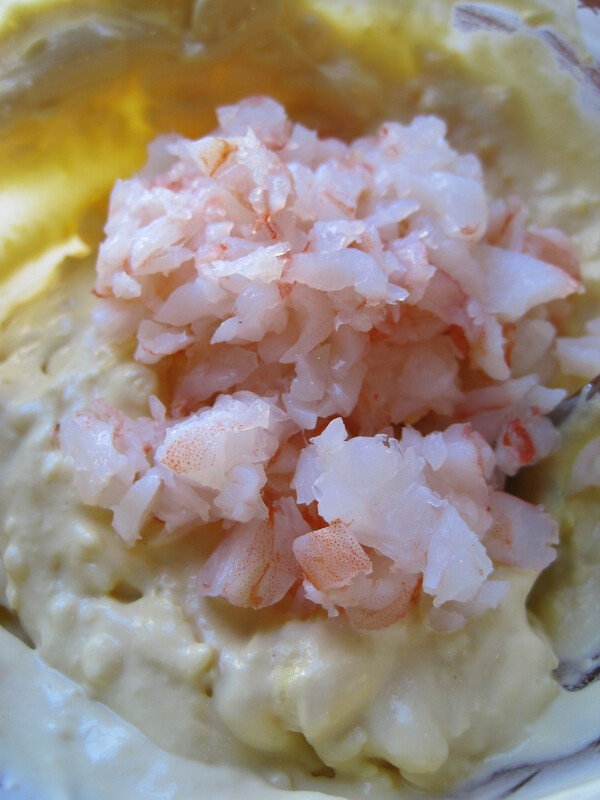 Add the mayonnaise, Dijon mustard, diced cooked shrimp, and Old Bay seasoning to the egg yolks and stir until combined. Spoon the yolk mixture back into the egg whites or use a piping bag and tip for a fancier presentation. Garnish each deviled egg with a sprinkling of chopped chives. Serve immediately or refrigerate until ready to serve. Easily the best deviled eggs I have ever eaten.